Unisys Stealth™ Solution Suite Contact Us for Pricing! The increasing sophistication, frequency and scale of cyber-crime are placing escalating pressure on IT to protect sensitive data and infrastructure. Meanwhile the strategic direction of IT is to transform the data center to lower costs, streamline existing process, and support a more mobile workforce. The need to guarantee the integrity and confidentiality of network data within shared infrastructures is growing exponentially. Securing information within the network and while data is in motion anywhere is more important than ever. In some cases, lives depend on it. Unisys Stealth renders users, data, and infrastructure invisible to cyber criminals. Built for the U.S. Department of Defense to secure sensitive information, Unisys Stealth achieved the National Security Agency’s National Information Assurance Partnership Common Criteria EAL-4+ certification, protecting data-in-motion across any network regardless if it is private or public. The good news is that Unisys Stealth Solution is available to everyone, bringing defense grade security to other public sector and commercial enterprises. 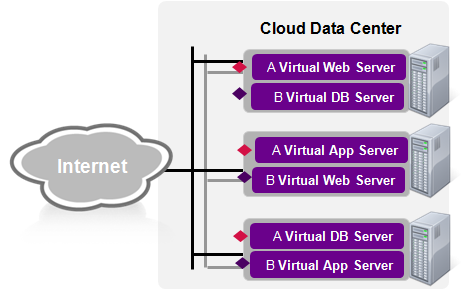 Enhances the security of the AWS Cloud. Communication to, from and between Stealth protected assets in the AWS Cloud is encrypted. Cloaks endpoints in the AWS Cloud. Stealth ignores all packets that are not Stealth-formatted with matching Community of Interest (COI) keys. Stealth protected VMs are cloaked from other tenants in the cloud and from hackers attempting to infiltrate the cloud. Enhances control of AWS assets. Stealth enabled VMs in the AWS Cloud appear to be in the company domain; unlike a standard AWS deployment, when using Stealth, encryption key management occurs in the company’s datacenter. Is easily implemented. Stealth leverages Microsoft Active Directory or any other identity store to enforce identity-based access. Secures data-in-motion and controls the information sharing within or across networks by employing an innovative data cloaking technique – all while vastly simplifying the infrastructure. Stealth assures security by transforming information using FIPS140-2 certified AES-256 encryption integrated with a new cryptographic data-dispersal algorithm that spreads data across the fabric of the network. Stealth Solutions for Network Security has been through the National Security Agency’s Common Criteria process and received EAL-4+ certification as a multi-domain network software solution for protection of data-in-motion across any network - private or public - qualifying Stealth to protect up to secret defense-level or sensitive industry information to support your mission critical requirements. 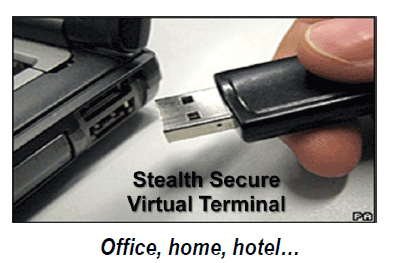 The Stealth for Secure Virtual Terminal delivers the Unisys Stealth Solutions for Network Security on a secure USB-based device. SSVT is designed to protect high value transactions, transmission of sensitive data, facilitate emergency preparedness, and is ideal for travelling, home-based, or guest users. It can be booted from virtually any PC or laptop and preconfigured to establish a virtual secure Stealth tunnel through any network - private or public - to another predetermined Stealth endpoint such as a URL, web portal, Stealth gateway, etc. Our solution guarantees a clean boot from the USB device that mitigates any malware that may have infected the PC itself. The Unisys Stealth USB-based device is a core component in an enterprise-class hardware, software and services solution that transforms the security of remote access. The Stealth Solution for Secure Virtual Terminal (SSVT) provides customized, dark network communications for authorized, authenticated avoiding security breaches which are complex and costly to resolve. SSVT is quickly provisioned, requires no application changes and facilitates security regulatory compliance. Instead of booting from a client hard drive, SSVT provides protection by booting from a tamper proof, locked, virus free operating environment, and safeguarding the transaction as it moves across the network. Stealth prevents malware from infiltrating the data by rendering the session invisible on any network, and preventing interaction with any non-Stealth network activity and devices. Additionally, SSVT can be configured to eliminate data loss at the end user's PC/laptop. Unisys Stealth for Mobile enables authenticated and secure access to application processing environments in the data center from mobile applications. With Unisys Stealth for Mobile, security starts in the data center and extends to mobile devices. It leverages application wrapping software that encrypts data-in-motion from the mobile app across the Internet -- securing it from hackers and evesdroppers. Unisys Stealth for Mobile secures the entire data path by protecting critical servers and virtual machines with Data Center Segmentation, connecting authenticated mobile users into secure Communities of Interest, and wrapping applications on the mobile device. Unisys Stealth is designed to protect business data and systems by creating a communications tunnel that is cloaked to any users or devices except those who are pre-identified as part of the “secure community” referred to as a Community of Interest (COI). This is unlike traditional solutions, which use physical topology to cordon off and protect high value servers, virtual workloads and applications. In contrast, Stealth enables security by using COIs, allowing the network to be simplified while protecting visibility and access to different servers and applications. As companies look to multiple geographies for new business opportunities, IT challenges can quickly become a nightmare. Confidentiality requirements or geopolitical challenges that may compromise IP and data integrity necessitate that systems at geographically dispersed centers be kept separate from the corporate data center. Unisys Stealth is designed to help enterprises shield data assets within a designated region while controlling access to corporate assets from users in that region. Creating an information embassy with Unisys Stealth enables an organization to establish a secure regional site in various geographic locations. 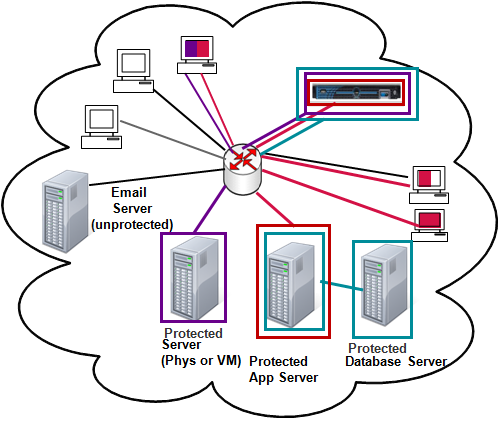 Organizations typically use VPNs to access the enterprise network from remote sites. 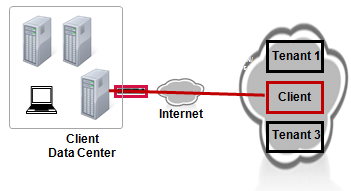 Unisys Stealth can be used in lieu of, or in conjunction with, deployed VPNs, to provide a higher level of security for both the information being transmitted and the endpoint sending the data. Stealth creates a communications tunnel hidden to everyone except those who are pre-identified as part of the “secure community” referred to as a Community of Interest (COI). An undetectable cryptographically secure tunnel into the network means avoiding the radar of hackers and ensures the connection remains protected from intrusion. You can’t hack what you can’t see! 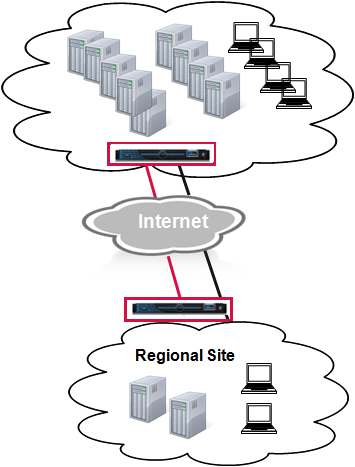 Stealth allows multiple user communities to share the same IT infrastructure, securely. 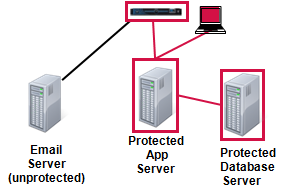 Stealth isolates applications so that only the authorized users can see and access the data unique to that application. In effect, you can’t hack what you can’t see. And, it works without application or infrastructure changes. Download the Unisys Stealth Solution Suite Brochure (PDF). Download the Unisys Stealth Solution Suite Secure Data Center Segmentation Brochure (PDF). 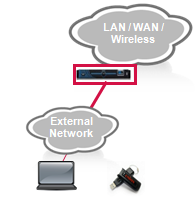 Download the Unisys Stealth Solution Suite Regional Isolation Brochure (PDF).